The website for the national tour of Camelot advertises its non-Equity version produced by Phoenix Entertainment, now playing at The Bushnell, as “The story as you’ve never seen it before.” Well, they got that much right as far as I am concerned, but probably not in the way they hoped. This “re-imagined” show will leave fans of the Alan Jay Lerner/Frederick Lowe musical disappointed. Based on “The Once and Future King” by T.H. White, Camelot tells the story of King Arthur (Bruchwalski), who, mentored by magician Merlyn (Mark Poppleton), becomes King of England after pulling the sword Excalibur from a stone. In an arranged marriage designed to keep peace between warring lands, he marries the beautiful Guenevere (Mary McNulty) and to their surprise, the couple falls into friendship and love. Arthur envisions an age of new chivalry and invites knights from far and wide to join him at his round table where justice and peace will rule (and where no one can sit at the head). Joining him are his old family friend, King Pellinore (also Poppleton), Sir Sagramore (Mark Edwards), Sir Dinadin (Jon McHatton) and the pompous Sir Lancelot (Tim Rogan), who becomes like a son to the king. At first, Guenevere takes a strong dislike to Lancelot who has such a high opinion of himself, but when he miraculously restores to life a knight he has wounded in a jousting tournament, the queen can no longer deny her attraction. She and Lancelot feel guilty about betraying the king they love in thought, if not in deed. When Arthur’s illegitimate son, Mordred (Kasidy Devlin, who spices up the insipid action here), arrives on the scene, he sets out to ruin Arthur by rekindling a passion among the knights for war and revenge. He finds an opportunity by convincing Arthur to stay away from Camelot one night. When Lancelot and Guenevere are caught in a compromising position, Arthur has no choice but to allow them to be tried for treason. The tone is dark, overall, on sets designed by Kevin Depinet. A modern-looking, curved, metal structure representing trees in a forest arches stage left paired with backdrops and medieval props while some cheesy shadow effects (with lighting by Mike Baldassari) create jousting scenes. Designer Paul Tazewell gets the costumes right, however, with lighter colors and elegant gowns for Guenevere. Of particular annoyance is a buzz echo of sorts house left, which was pronounced during most of the first act (sound design by Craig Cassidy). Often Pellinore cannot be understood. Songs sung not quite on the note at times, odd musical arrangements (Music Direction by Marshall Keating; Musical Supervision and Additional Orchestrations by Steven M. Bishop) and a small orchestra make listening to songs like “How to Handle a Woman,” “What Do the Simple Folk Do?” and “The Lusty Month of May” a less-then-satisfying experience. “If Ever I Would Leave You,” also with some notes off the mark and accompanied awkwardly at first by a lone cello, is delivered by a stiff Lancelot who elicits a wooden response from Guenevere. Fans of the original production will notice that the character of Morgan LeFay and Guenevere’s song “I Loved You Once In Silence" are not included here. One performance I did enjoy was of Tom of Warwick, a young lad who restores Arthur’s hope in the message of Camelot. I am not sure which boy played the part the night I attended because the program note simply lists the two local boys who share the part: Ian Rothauser, a 5th grader at John Wallace Middle School in Newington, and Patrick Jensen, a 4th grader at Aiken Elementary School in West Hartford. Kudos, whoever you were. You restored my hope in the future of productions with your fresh, bold performance of just a few lines. And Kate Turner offers a pleasing soprano as Nimue, the Lady of the Lake, who calls Merlyn to his eternal rest. If Grabau returns to the part this week and you see a vast difference in the production, please let me know. I’d like to think that Camelot might have a bright shining moment while in Hartford. 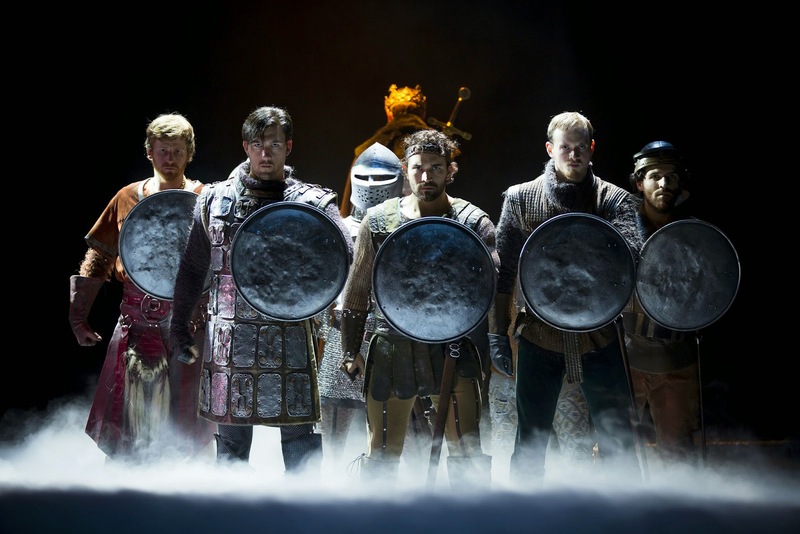 Camelot plays through April 26 at The Bushnell, 166 Capitol Ave., Hartford. Performances are Tuesday, Wednesday and Thursday: 7:30 pm; Fridays and Saturdays: 8 pm; Saturday at 2 pm; Sunday 1 and 6:30 pm. Tickets $26-$80. (860) 987-5900; www.bushnell.org.